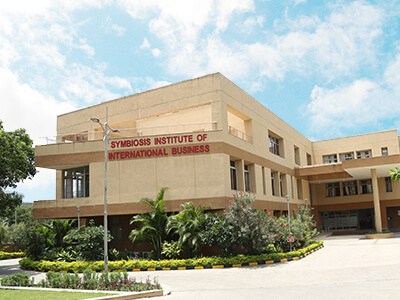 Symbiosis Institute of International Business (SIIB) is a constituent of Symbiosis International University (SIU) . Its among the Top Business schools in India . The Moto of SIIB Pune Under Symbiosis International University (SIU) had been to adapt to global business challenges . Hence SIIB Pune offers Regular guest lectures, workshops, industry visits, live projects and mandatory two months summer internship . All Admission in MBA in SIIB done by Symbiosis National Aptitude Test SNAP conducted all over India by Symbiosis International University (SIU) . Mission To inculcate spirit of ‘Vasudhaiva Kutumbakam’ (The world is one family). To contribute towards knowledge generation and dissemination. Promote ethical and value-based learning. To foster the spirit of national development. To inculcate cross cultural sensitization. Develop global competencies amongst students. To nurture creativity and encourage entrepreneurship. To enhance employability and contribute to human resource development. Promote health and wellness amongst students, staff and community. To instill sensitivity amongst the youth towards the community and environment. Specialisations Marketing, Finance, Human Resource and Supply Chain Management ,Taxation . Eligibility Graduate from any statutory university with a minimum of 50% marks and 45% for SC/ST .Candidates appearing for final year examinations can also apply. A candidate Graduated From Foreign University need Association of Indian Universities (AIU) Equivalence certificate . For Agri Business – General Basic along with Candidate must hold a Bachelor’s Degree of any statutory University in Agri Sciences, or Agri related disciplines like Agri Engineering, Fisheries, Bio technology, Botany, Bio chemistry, Veterinary Sciences, Horticulture, Food Technology etc. For MBA Energy & Environment – Engineering graduate (BE / B. Tech. ), B. Architecture, B.Sc. (Environmental Science) only Along with General Requirement . SIIB Pune MBA Major Recruiters ITC ABD, Darashaw, Accenture, ANZ Bank, HDFC Bank, Dun and Bradstreet, Kirloskar, ICICI Bank, Godrej & Boyce, Axis Bank, Daimler, HDFC Life, DHL Logistics, Infosys BPO, and Crisil , Bayer, L&T Finance, Mahyco, Mahindra & Mahindra, Axis Bank, Godrej Agrovet, IFFCO, ICICI Bank, HDFC Bank, Tolaram Group and GVR , Solairedirect, Geocycle, L&T Finance, KPMG, Adani Ports, ATG .